Custom Modular Homes Building Systems LLC. You can contact me directly by clicking on the hyperlink below. Please include your Name, Address, Zip Code, Phone, Cell and Fax numbers. The reason for the contact, If you and when you would like to build also if you have or are looking for property and where. Thank you Richard. From NYS Thru-Way at Exit # 18 (New Paltz, NY) get off at the exit, 4.5 miles. Exit Thruway toll booths continue straight to traffic light make and a left turn onto State Rt. 299 West, (Main Street). 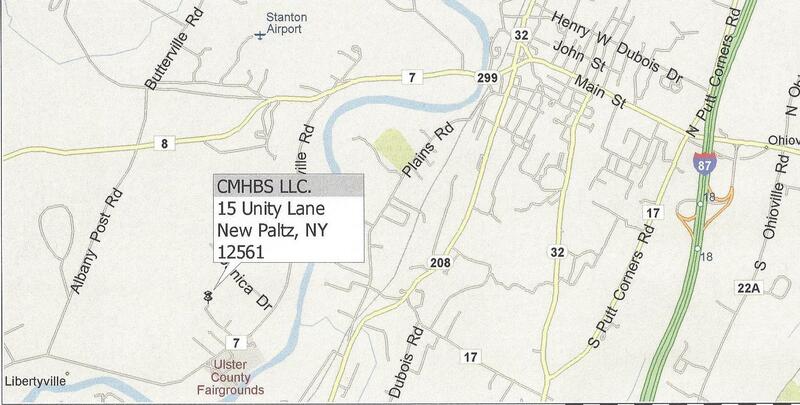 Continue thru the Town into the Village of New Paltz and cross over the steel bridge over the Wallkill River. Continue about 1-1/2 mile past the Wallkill View Farm and make next left turn onto County Route #7, Libertyville Road. Continue approximately 2 miles to Right Turn onto Unity Lane, Note County Pool on left at turn. Continue down Unity Lane look for #15, then up onto my private driveway for about 1,500 feet. CMHBS Office is LAST HOUSE ON RIGHT at the end of the LONG Driveway. We are a Two Story Country Colonial with attached garage. Look for small signs "CMHBS Modular Homes", Green and White signs. Park at the parking area at the end of the driveway an walk to our sidewalk and Front Door, please Ring Bell. Exit at the Maybrook #5 exit go bottom of ramp and make left turn onto SR Rt. 208 head North into Walden. At traffic light make a right hand turn and continue on Rt208 to the Hamlet of Wallkill make right turn and continue on Rt208 into Village of New Paltz. Continue about 1 1.2 mile past the Wallkill View Farm and make next left turn onto County Route #7, Libertyville Road. Take SR Rt. 44/55 at Kerhonkson and head East over the Minnewaska Mountain. Pass under a steel bridge and head down 44/55 pass the Hair Pin Turn to a Left Turn onto SR Rt. 299, head East about 5miles to a Right Turn on to County Rt. , Libertyville Road. Copyright © 2001 Custom Modular Homes Building Systems LLC.. All Rights Reserved.